I can’t count how many times I have been to a store and have seen people with their baby’s car seat on top of the shopping cart. You know, where they pull open the child seat of the shopping cart and balance the baby car seat between the handle of the cart and the child seat. I know it seems like a super convenient way to shop with your baby but is it safe? NO! Did you know that car seats falling off of a shopping cart is an actual issue and can cause serious injury or even death? The shopping carts have a warning on it telling you not to place your baby’s car seat there but people seem to commonly ignore that warning. The shopping carts have a warning on it telling you not to place your baby’s car seat there but people seem to commonly ignore that warning. So what do you do when you have to buy a large number of items from a store but your infant is asleep and you need to take in the car seat? You don’t have room in the cart basket for both the baby seat and the stuff you need to buy so what do you do? Well, I have an infant car seat shopping solution for you. The Binxy Baby Shopping Cart Hammock. 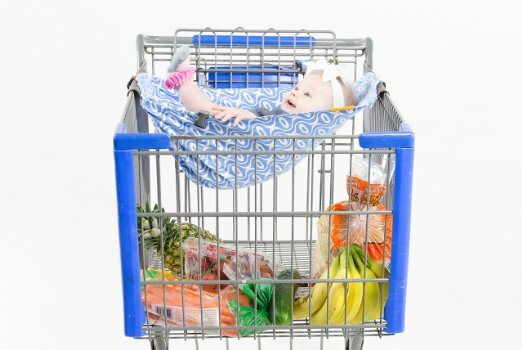 What is the Binxy Baby Shopping Cart Hammock? This little gem was actually created and designed by a mom of 4 who realized she had a big problem when out shopping with an infant and toddler. It is just what its name suggests a hammock for shopping carts. It has big, sturdy clips that are 12 inches on both sides that clip over the edge of most shopping carts (20″-24″ wide). Then the clips are secured by a Velcro strap. Because the clips are so long and it is secured with the Velcro, the Binxy Baby stays put and will not tip or come unhooked. They also use two layers of upholstery weight fabric and reinforce the seams to ensure the product is stable. It can hold up to 50lbs! 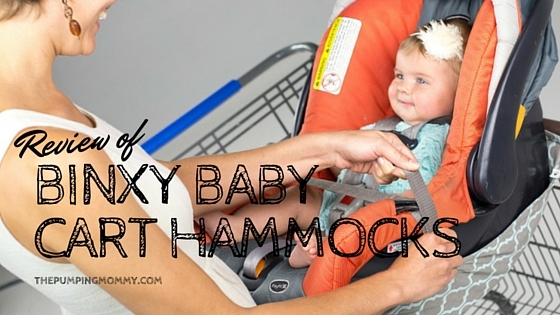 You can place the infant car seat in the hammock or just your baby. If you place the baby directly into the hammock, note that it is made for newborns to baby’s who can sit on their own. The hammock won’t fit the large carts at wholesale stores like Costco (I did see a mom got it to fit on Sam’s carts) so that’s a bummer but if you are like me then you only frequent those store about once or twice a month. 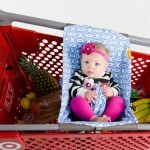 The main issue is the quick run into Target or the grocery store where hauling a baby seat can become a pain. The other neat thing is that you can fit two hammocks side by side which makes this an ideal product for twins. I don’t have twins but if I did I imagine I would be at a loss on how to shop with two infants in tow. According to American Academy of Pediatrics, 85% of all children who are injured in a shopping cart accident are under the age of 5. And 45% of all children injured end up with fractures (!)…Mind-blowing. 90% of the time a parent or guardian was present for the fall. Basically, you standing there doesn’t mean they won’t or can’t fall out. I love the Binxy Baby Hammock for many reasons but giving moms a safe alternative to placing a car seat on top of a cart is a huge reason this is one of my favorite products! Every time I see a mom make that mistake in a store, I want to share this product with her! Spending the money for a product like this is a no-brainer in my book! Let’s See the Binxy Baby in Action! This video is a quick view of how to secure the hammock to a shopping cart. You can also see how small the hammock is rolled up which means it will fit nicely in your diaper bag. **One thing I want to note is that she mentions a price in this video. I hate to be the bearer of bad news but that price has gone up. This product has become quite popular…So you know how that goes. What are Moms Saying About the Binxy Baby Hammock? So, proof is in the pudding, right? If you read the reviews on Amazon, you will see that the Binxy Baby Hammock has a 4.8-star rating out of 5. Impressive. So what do moms really think? Obviously, a majority of the reviews are overwhelmingly positive (hence the 4.9-star rating) but of the few I read that had critical feedback, the main concern was the weight limit. Some said they could only use the product for a short time because their baby was quite large. It does hold up to 5olbs. So, I am assuming they must be talking about height? The F&Q on the Binxy Baby states that it fits a seated height up to 19″. That means you measure the top of their head to their bottom. If you have a tall baby, that might be something to consider but you can still use the car seat in the hammock up to 50lbs so it should work fine for some time. 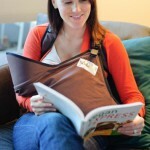 In the end, the purpose of this product is to help make our lives as moms easier. I think in many ways it accomplishes just that. 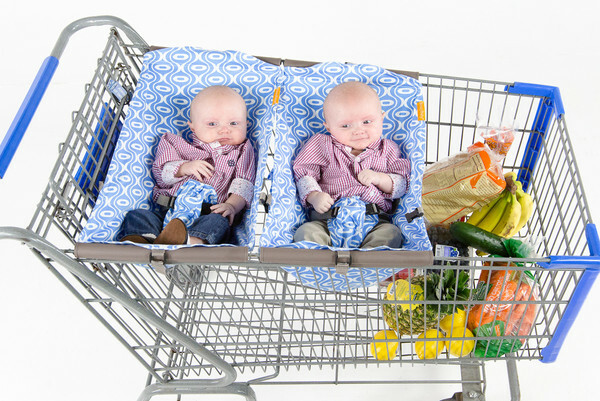 If you have one baby or three, this is a great option for making shopping trips more manageable. Where can I buy a Binxy Baby Shopping Cart Hammock? The best place I found to buy is Amazon. You need to be sure the seller is actually Binxy Baby since you don’t want a knockoff. Click Here to read more about the Binxy Baby Hammock! 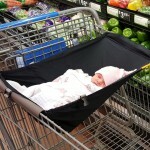 I hope you and your baby love the Binxy Baby Shopping Cart Hammock as much as I do! Hey just so you know these DO fit on the Costco carts! I went to Costco yesterday and it fit great. You just clip it to the end of the cart where it’s a bit narrower instead of at the top of the cart near where you are pushing because that part is wider. It fit no problem and worked well. Just thought I’d give you this tip so you could update your post! Awesome! Thank you for telling me. I have not tried mine on a Costco cart in a while. I think I will give it another go!